Most residential and commercial buildings in San Diego today incorporate daylighting strategy into their designs. 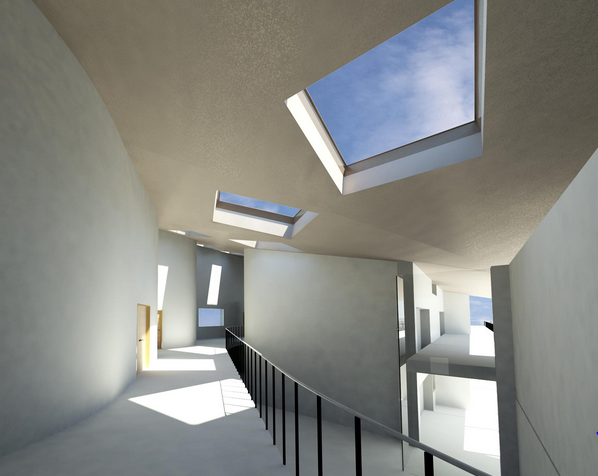 Daylighting allows natural light to enter the interior of a building to provide natural illumination. Most buildings with flat San Diego roofing have prismatic skylights and light tubes that take the most advantage of their wide and flat surfaces. Daylighting involves the effective use of windows and other openings that allows sunlight to provide internal lighting during daytime. Daylighting designs on buildings are built either to provide optimum visual comfort with the use of natural light or reduce energy use and its attendant electricity costs. Daylighting may either be passive or active. Passive daylighting collects sunlight with the use of non-moving or static devices such as skylights, windows or light tubes and reflect the daylight into the building’s interiors. Active daylighting collects sunlight by employing mechanical devices that either track the sun’s movement using sensors and lens or through electronic motor devices with installed programs to follow the sun’s path based on a pre-determined sun chart. Severely studies have confirmed the concrete benefits of natural light on human physiology, including improved student academic performance and general health, increased retail sales and enhanced employees productivity, and significant fall in employee absences from work. Electrical lighting requirements for buildings are reduced by as much as 70 percent with the relatively simple action of installing prismatic skylights on just 4 percent of the total San Diego roofing surface. Less electrical lighting is required to illuminate the rooms because of the natural daylights coming in through the skylights and windows, which translates to enormous savings in energy costs. The investment on skylights will pay itself in about two years’ time. In six to eight years, prismatic daylighting will pay for the cost of an energy-efficient roof system. The cost of cooling a building is also drastically reduced through daylighting. Natural daylighting is noted to generate practically no or minimal heat, thereby reducing the constant need for air conditioning in warm places. Many power plants generate energy through the use of fossil fuels. Burning fossil fuels significantly contribute to air and water pollution and greenhouse gas emissions. Using more daylight as lighting lessens the demand for artificially-generated energy and its undesirable consequences. With the heightened public awareness on global warming and climate changes, more people now appreciate the merits of daylighting.